How is Involved better than external survey links? Involved surveys are one-click, single-question, and tend to go viral locally. The average political email click rate is 2%. With Involved, click rates average ~20%. The Involved Dashboard provides geographic analysis, result-sharing controls, private comment feeds, and residence verification. Segment and filter respondents, compare historical data, create tags by response type, and develop targeted survey campaigns. How is Involved better than phone surveys? 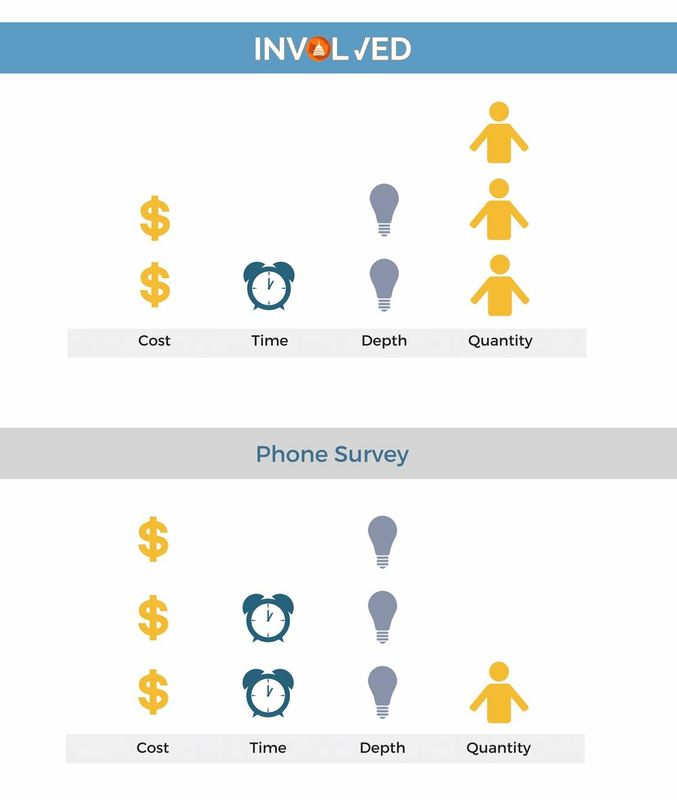 Phone surveys typically collect dozens to hundreds of responses after weeks of outreach. Involved surveys average 20% response rates via email within 48 hours. Phone surveys typically take weeks. Involved surveys take five minutes to create and release. Involved polls are a fraction of the cost of consultants and polling agencies. To discuss pricing for your community, send us a message. Involved is available to all levels of government, advocacy organizations, academic institutions and consulting agencies. What are addresses used for? Respondents enter their physical address so that they can be verified as constituents. Specific addresses will never be shown without permission, only aggregated as part of your geographic heat map display.